The Ruhr region is quite the opposite of what was on show in the context of Capital of Culture 2010. Steel and town, two words that often go together. In the Ruhr region they constantly blend. Inextricably. And that has always been the case. But not as equals, as partners, as the relationship has always been one of tension, confrontation, conflict. First came industry, came coal and iron—and all that was required to mine the minerals and melt the ore. Then came everything else, the roads, the canals, the rail tracks, the bridges, the pipes, the workers, the homes, the housing estates, the administrative buildings, the churches, the schools, the pubs, the stadiums, the gardens, the parks. Urbanity? Rampant urban growth whichever way you looked—to this very day. “In the beginning was the mine”, “the mine founded the estate”, “the estate grew and became a town,” wrote Heinrich Hauser in 1930 in his documentary “Schwarzes Revier” (black zone). Steel ruled over the town, threated the town, controlled it, exploited it. And not the other way round. This sequence contradicts the customary rule. And this relationship defined all other relationships in the region. Even after the surface area claimed by production shrank and was focused along the banks of the Rhine. There’s no overlooking this fact to this very day. 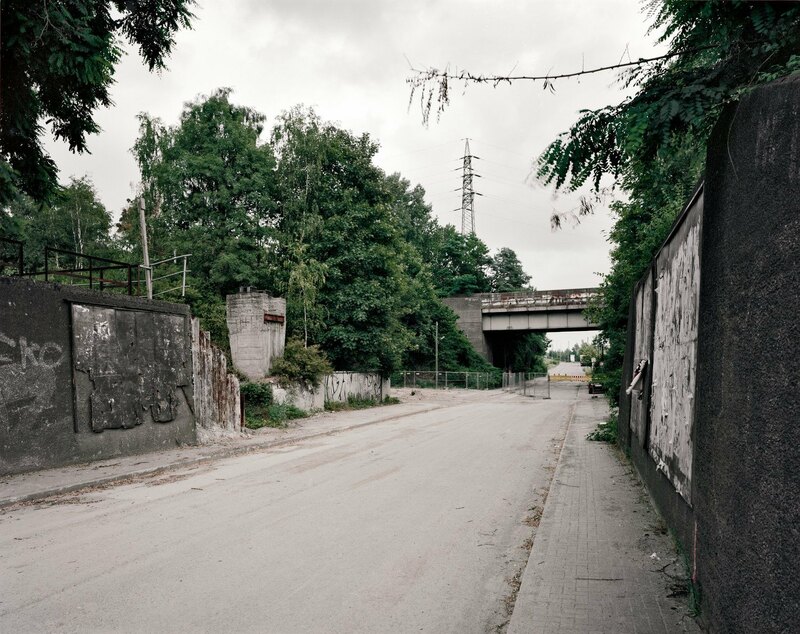 The photographs by Bernd Langmack and Haiko Hebig explore this relationship and document its impact on Duisburg and Dortmund, the twin towns flanking the west and east of the mining region. 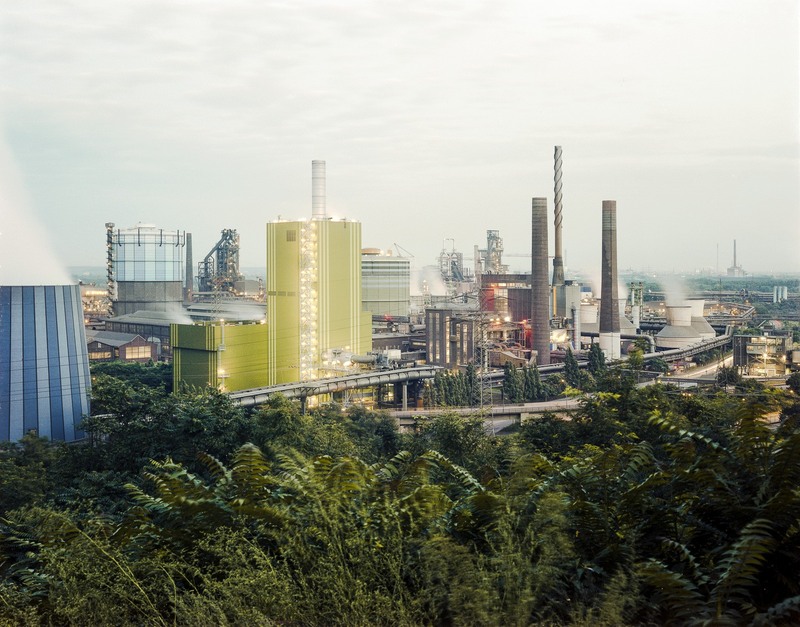 In Duisburg, Thyssen-Krupp operates one of the world’s largest steel-making complexes, a city within a city that runs for kilometers northwards along the Rhine, truncating the Bruckhausen district from the river. Thyssenhütte consists of a coking plant, three sintering lines, four blast furnaces and two oxygen steelmaking facilities boasting five converters; in 2010 it was rolling out close to nine million tons of crude steel. The complex is constantly being upgraded, its productivity enhanced, and the payroll always being pruned. The district opposite is gradually dying; entire streets with works housing have already been torn down. For many years, Dortmund was the second-largest steelmaking location in the Ruhr region, until the industry closed up shop there in 2001 and has since been completely focused in Duisburg. Krupp bought out Hoesch in 1992 and later merged to form Thyssen-Krupp. In the mid-1960s, Hoesch employed in excess of 40,000 workers, and five times as many were indirectly dependent on the company’s fortune. Today, a mere 1,400 staff members work the cold rolling mill, the hot-dip coating line and the electrolytic galvanization plant. Of Hoesch’s hot operations, only two steel-processing companies have survived, the one a heavyweight steel profiles line, the other the Rothe Erde ring rolling mill. These are concentration processes that have (further) upended the balance in the Ruhr region, and in the two towns. And the images Bernd Langmack and Haiko Hebig have created tell the dramatic tale of this change and the resultant social and urban planning problems. Steel and town in Duisburg. In Bruckhausen what separates the two, the plant and the housing estates, the machines and the men, is a four-lane highway, the Kaiser Wilhelm Strasse. And the light at night: on the one side, in the west, the steel plant, expansive and bright; on the other, in the east, the township, deserted and dark. Langmack juxtaposes the two, and his sequence of images constantly changes the side of the road he’s on: houses worn out by use, houses left open inside and outside, the hot rolling mill in operation as opposed to the greyness of vacancy, the smoking oxygen steelmaking facility as opposed to the exposed fire protection walls, peeling wallpaper and removal crates left behind, blast furnaces behind bushes and a carpark opposite trashed properties, street corner and industrial vista in the snow. The steel plant exudes an air of functional efficiency and incredible productivity, the township opposite seems to have been uncoupled from life, abandoned, condemned to death. The intervening road is a dividing line in many senses, between growth and slumming, present and past. Steel and town in Dortmund. What links the plant and the housing estates, the machines and the men here is their absence. Hebig’s images are—empty. Nothing there, no one at home. Where once Blast Furnace 7 glowed at the Westfalenhütte all you now see is wasteland. It opens out to the eye behind Borsigplatz—seven times larger than today’s downtown. Huckarder Strasse is now closed to traffic, there’s a fence cutting it off, no new posters on the billboards, spelling no traffic and no passers-by either. A black-topped expanse has replaced the production facilities, and trivial shopping-mall architecture now characterizes “Neue Mitte Eving”. The public spaces have the air and residential quality of an old backyard, and “Gneisenau Civic Park” now looks all too much as if it’s cars that have replaced the civic functions. At its very heart Dortmund now boasts close on a thousand hectares of wasteland that is now almost encroaching on downtown. Hard not to notice, but somehow rarely noticed: This emptiness defines the city’s appearance far more than all the things that stand out resplendently in the colorful “New Dortmund” brochures. Scars, non-locations, inhospitable zones: Their presence is testimony to a past that has disappeared once and for all, and points to a future that is still to be identified. Steel and town: This publication is subtitled “Views on the Reality of the Ruhr Region”. “Views” in the double meaning of the term, signifying both representation and opinion. Ruhr 2010, the European Capital of Culture, definitely did not want to notice these views, let alone accept them: “We want to deploy strong, fresh images to do away with that outdated image so damaging to the (Ruhr) region,” Fritz Pleitgen stated in autumn 2009, sketching the direction things would go in. The “old” industry, and its ability to define the face of the region even when waning, was visually excluded, suppressed, declared a myth—and mystified in the process. Cultural policy as a means of repression, of constructing an image and foregrounding wishful thinking. Nothing new there. The year after, the exhibition is also a reflection on Ruhr 2010 Capital of Culture, contradicting its strategy and the images it showcased. There’s no need to accept the reality of the Ruhr region that Bernd Langmack and Haiko Hebig present in their photographs, or find it elegant. But it needs to be noticed if the Ruhr region is ever to be changed. This text also appears in the Stahl+Stadt photo book. Translation: Jeremy Gaines.